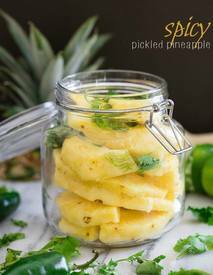 This pickled pineapple recipe from Running to the Kitchen has a hint of spice from sliced jalapeños and is the perfect sandwich and salad topper with it’s tangy sweet bite. The perfect snack when you want something spicy and sweet! Pickled Pineapples are sweet, sour and spicy all at the same time!! And they are so easy to make!